This Myanmar golf package is a fantastic golfing adventure. You get to play golf at various course’s around Myanmar and get to see some of the best sights that Myanmar has to offer. So what’s behind the golden façade of the Shwedagon Pagoda? 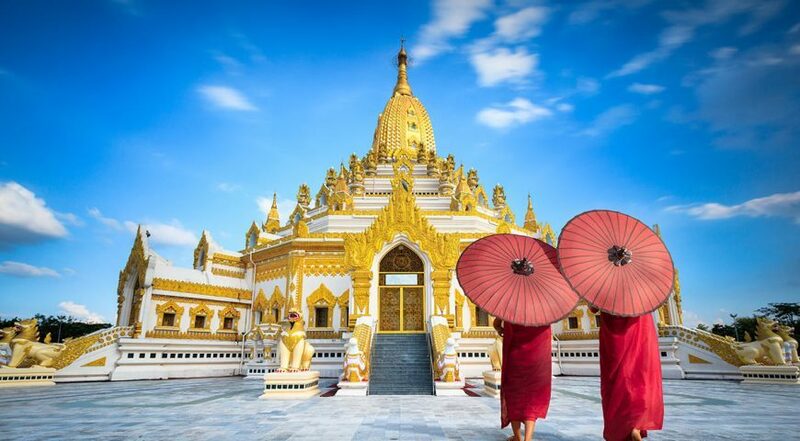 During this interactive half day tour we take you through the back door and show you the full history of the pagoda, the daily life of all people living in the immediate surroundings of the pagoda and a deeper insight in the Buddhist religion and how the spiritual belief is mixed with the belief in nats – the Myanmar spirits. An intriguing half day tour starting from the bottom of the hill and passing the workshops, markets and monasteries which will be useful or even essential to understand more of the country during the rest of your journey. The tour includes offerings to monks and the pagoda, a visit to a fortune teller and a Burmese lunch. Golf at Pun Hlaing Golf Club – The Pun Hlaing Golf Club was established in 2000 and is located northwest part of Yangon, about 45 minutes drive from city center. Pun Hlaing Golf Club encompasses 18 holes championship golf course expertly designed by the renowned Gary Player, one of the world’s legendary golf players. Transfer to Yangon airport for flight to Bagan. A full day tour by car, with an experienced guide through Bagan will show you the best known temples of the area. We start the day climbing Buledi Pagoda to get a first (impressive) view over the whole area. From here the guide plans his way to some of the other amazing temples that have been here for hundreds of years. Places like the Ananda, Dhammayangyi, Sulamani, and Thatbyinnyu will certainly impress you. Lunch will be taken at a local restaurant and around 4pm we continue the tour by horse cart to Pyathada pagoda for sunset with some refreshing drinks served! Oh… we forgot to mention the best part of this tour; whenever you see a temple you like just ask you guide to stop to have a look at it – simply pick your own favourite temple. Golf at Bagan Golf Resort – The Bagan Golf course was established in 1996 and is located next to Amazing hotel at the back of the archaeological zone- and some of the holes play among the pagodas. Unlike other golf courses, it is located in the middle of the world-famous Bagan temples and pagodas. Surely is an oasis in the dry zone as the relaxing garden next to 11th century ruins and the Ayeyarwaddy river stretching out beyond. The 18 holes Bagan golf course wanders in between some of the ancient pagodas. Transfer to the airport for flight to Heho. Upon arrival, drive to Kalaw, the former British hill station Kalaw has a bit of a colonial atmosphere with the old villas, churches and schools. The town is inhabited by Burmese, Nepali and Indian as well as several hill tribes like the Padaung and the Pa O. Kalaw is the starting point for rewarding treks. Play golf at Kalaw golf course – The 18-hole golf course in Kalaw is one of the oldest ones in the country where golf is a popular sport. In the mountains, surrounded by pine trees at an attitude of more than 1100 meters above sea level a cool breeze in the morning makes the temperature perfect for a round of golf. During a half day excursion we bring you to the green to enjoy a relaxing game of golf with your friends. Inle Lake in southern Shan State is a vast natural lake surrounded by traditional Shan villages. On the lake itself the Intha people have been living for many centuries in village built entirely on stilts on the lake. Today we will take you by private motorboat around the lake to discover the natural beauty of the lake, visit the floating gardens, hopefully see some of the famous leg rowers and have some tea at a local family’s house. On and around the lake traditional markets are held in different villages according to a 5-day rotating schedule and today we will take you to visit a colourful market, frequented by Shan and PaO people living nearby. We will certainly also visit a local cheroot factory (where the Burmese cigars are made), floating tomato gardens, Intha Heritage house where the Burmese cats are bred and if wanted we visit a weaving factory. We return to the hotel around 4 PM, in time for sunset. Golf at Aye Thar Yar Golf Resort – Drive to Ayetharyar golf resort, perfect set up amidst the Shan Plateau which was established in 1995. This course has a challenging per 72 with 7380 yards with perfect cut of Bhamuda grass with rather large greens.